Pin-1 GND (also called: ground, common, return, or negative voltage) is the most common polarity, and it is sometimes referred to as Arri polarity because Arri popularized this wiring scheme. Pin-1 +VDC (positive voltage) was more common during the analog era in the US, and some companies still use this wiring scheme. Some devices are polarity agnostic, meaning they can take either polarity cable. 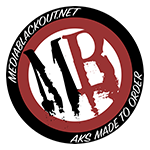 Some polarity agnostic devices are as follows: Media Blackout's BreakerBatt and BreakerBox, Zacuto's Gratical Eye, and PLC Electronic's 2-channel Bartech Digital Receiver. 1:1 - Cable is wired 1:1, or pin-1 to pin-1 & pin-2 to pin-2; This means that the connectors are wired to pass the same polarity that is fed into it. It doesn't matter which end of the cable is plugged into the power source or device because the wiring is symmetrical. Crossover - Cable is wired 1:2, or pin-1 to pin-2 & pin-2 to pin-1; This means that the connectors are wired to change the polarity that is fed into it. It doesn't matter which end of the cable is plugged into the power source or device because the wiring is symmetrical. My BreakerBatt doesn't seem to be working. What can I do to Troubleshoot?